MHS junior Matt Gilkey (20) singles in the fifth inning of the Marauders’ 8-0 victory over Belpre on Thursday in Rocksprings, Ohio. ROCKSPRINGS, Ohio — If they don’t score, you can’t lose. 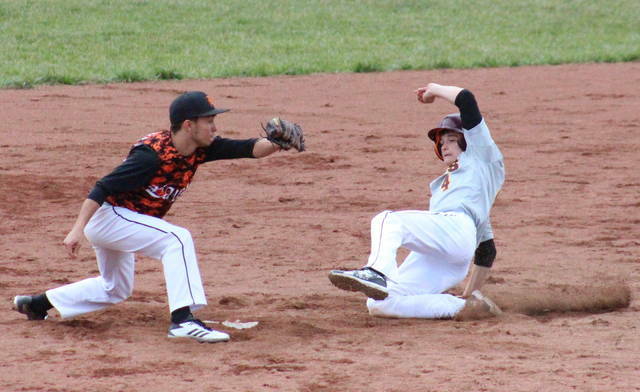 The Meigs baseball team claimed its first shut out of the season on Thursday in Meigs County, as the Marauders breezed past non-conference guest Belpre. 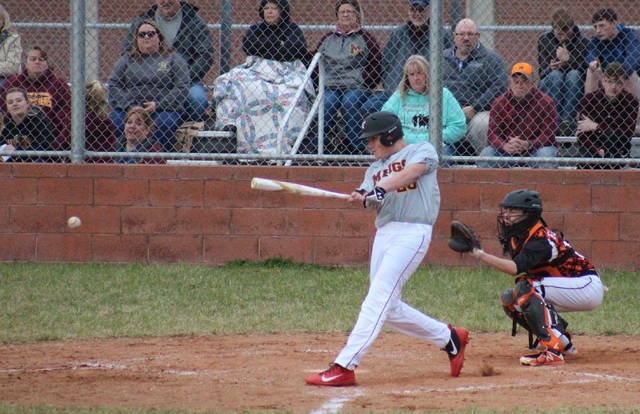 The Marauders (1-1) — who began the season with a 2-0 loss at Piketon on Saturday — were held off the board for the first four innings on Thursday, but had runners in scoring position in three of the frames. Belpre stranded two runners in scoring position in both the second and fourth innings, but didn’t advance past second after that. 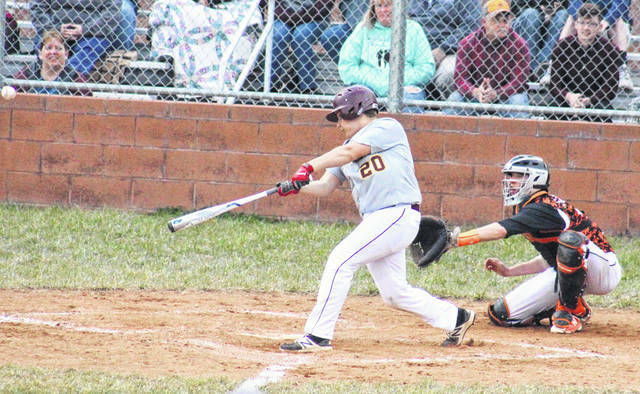 Once the Maroon and Gold finally broke through in the top of the fifth, they weren’t slowing down, as Meigs sent a dozen batters to the plate and scored eight runs on the strength of nine hits in the frame. Meigs had a chance to add on with runners in scoring position in the sixth, but settled for the 8-0 victory. Matt Gilkey was the winning pitcher of record in a complete game for the Marauders, striking out nine batters, walking five, and allowing two hits. Freeland took the loss in five innings of work for Belpre, striking out two, walking two and allowing eight runs on 10 hits. Leading the Marauder offense, Andrew Dodson and Wesley Smith both singled twice and scored once. Cory Cox doubled once and scored twice in the win, Alex Pierce added a double and a run, while Gilkey, Landon Acree and Briar Wolfe each singled once and scored once. Cole Arnott and Aiden Roush added a single apiece for the hosts. Godfrey and Brand both singled once for the guests. 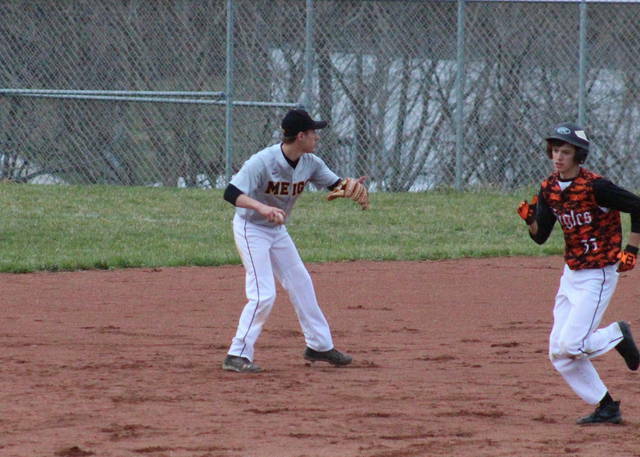 Meigs committed one error and left eight runners on base, while Belpre had five errors and five runners stranded. The Maroon and Gold will be back on the field to open Tri-Valley Conference Ohio Division play on Monday at River Valley.